Craving a cold beer while floating down your local river or at the summit of an awesome Appalachian hike? Well, Hi­-Wire Brewing now says “can do.” Canning is on the horizon for Hi­-Wire Brewing: Pushing their way into new markets, stretching all the way to the Carolina coasts, most of Tennessee, and parts of northeast Georgia. Hi­-Wire will be releasing their flagship Hi­-Wire Lager, as well as a new, never­before released beer, Hi­-Wire Gose. The Gose (4.2% ABV), which is brewed with Pink Himalayan Salt, is tart, supremely drinkable, and incredibly balanced with a complex fruit character. Crisp citrus and lemon­lime from coriander marries with Hi­-Wire’s house Lactobacillus strain, creating subtle notes of stone fruit and apricot in this hazy, sessionable sour wheat beer. 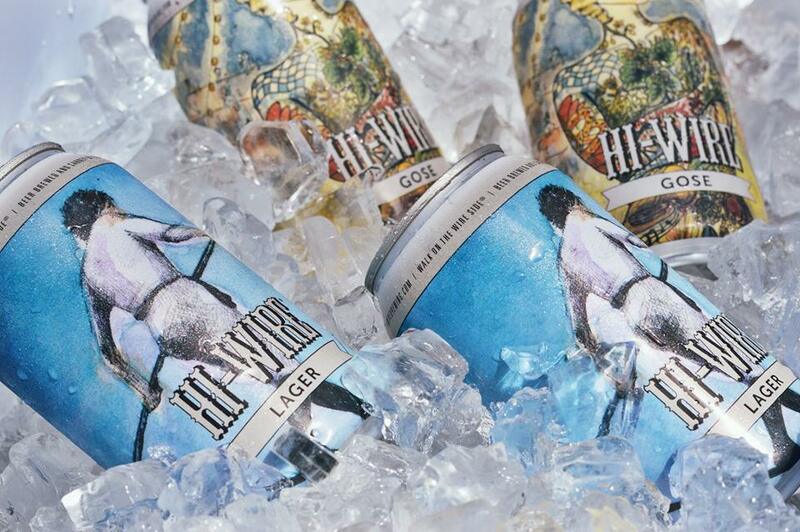 The Hi­-Wire Lager (4.6% ABV), one of their four flagship beers, is a true American lager that is as approachable as it is delicious, a perfect balance of light pilsner malt and German hops. Only released after reaching peak maturity, this lager is your handcrafted option when only a refreshing, light beer will do. While Hi­-Wire plans to continue using bottles as their primary method for packaging beer, they are excited to explore this first run of cans to see what consumers make of it. Additionally, they cannot ignore the pros of canning: sustainability, decreased shipping costs, and tapping into an untouched market. The first run of cans will be released at their Big Top Production Brewery, located at 2 Huntsman Place, on Saturday, June 4th with a crawfish boil. In addition, Hi­-Wire will be selling cases of Gose and Lager cans for $30 for that day only. This official Asheville Beer Week event will declare that summer, the season of cans, has arrived. For more information, check out our events calendar.